This sturdy, stainless steel grater has four shredding options, and looks stylish enough to use tableside. 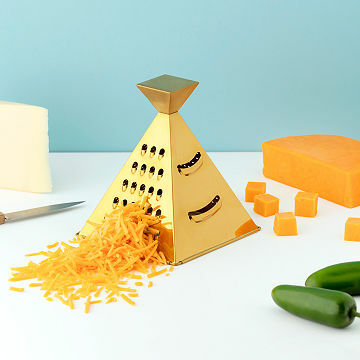 We think this golden pyramid is Mexican, not Egyptian—because nachos. Stylish enough to use tableside, it's easier to use than a box grater, thanks to angled sides and a solid handle. With four different shredding options for cheese, chocolate, vegetables, or zesting citrus, it's an eye-catching tool that brightens up a table or kitchen counter. Worthy of note: everyone in our office who sees it says, "How cool!" Designed in Brooklyn. Made in China of plated stainless steel. Looking for tasty ways to use your shredded cheese? Our Buenos Nachos Cookbook contains over 75 recipes from culinary leaders and celebrities.